Could 1 Chart Spell the Fate of U.S. Treasuries? Home » Could 1 Chart Spell the Fate of U.S. Treasuries? Last month we discussed the disconcerting trend taking place in the market for U.S. Treasuries. As of October 28, the foremost treasury holders – countries like China, Saudi Arabia, and Japan – were creating the biggest sell-off we’ve seen in recent history. 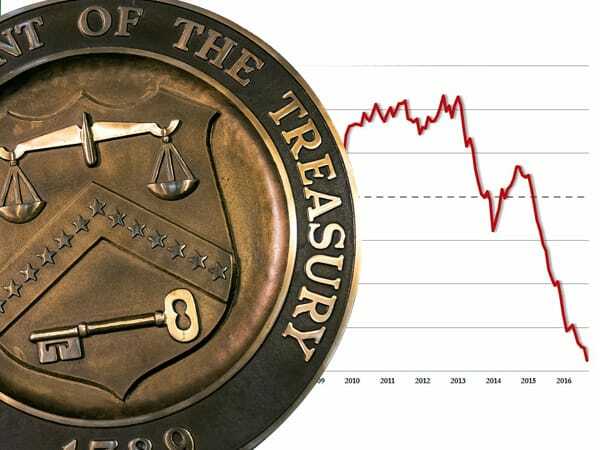 As a result, the level of “custodial paper” – essentially money paid by foreign countries to buy U.S. Treasuries and held by the Federal Reserve – dropped to its lowest level since 2012. In other words, countries started cashing in treasuries faster than they have in years. But now, the situation is getting even worse. Changes in stateside political headwinds and a continuation of treasury liquidation by foreign central banks paint an ominous picture. Could this seal the fate of U.S. Treasuries? 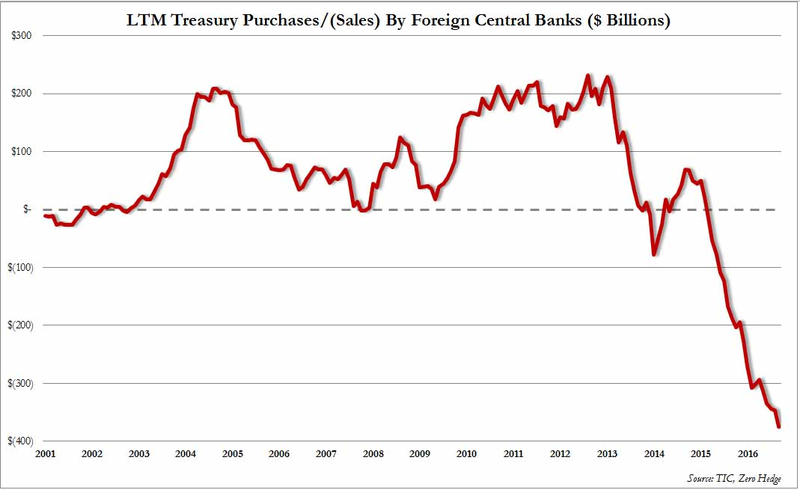 You don’t have to look much further than the data on U.S. Treasury sales by foreign central banks to understand the gravity of what’s happening. The following chart covers selling activity all the way back to 2001, and it suggests we’re in the middle of an unprecedented sell-off. As you can see, we’re venturing into new territory, and nobody knows for sure where this trend is heading. Saudi Arabia has a pivotal role in what we’re seeing today for two reasons. First of all, it holds more U.S. Treasuries than any other oil-producing nation. Second, and the main reason for its selling activity, it’s being forced to offset financial woes caused by the steep drop in oil prices this year. Generally speaking, Saudi Arabia has little incentive at this point to keep holding its stake in U.S. Treasuries. Plus, there’s a third variable coming into play as Donald Trump enters the White House. Trump has flirted with the idea of banning oil imports from Saudi Arabia and other OPEC countries if they don’t support the fight against ISIS, and it’s ruffling a lot of feathers. If he follows through on that idea, it’s conceivable to think that Saudi Arabia would be inclined to unload even more U.S. Treasuries, both out of spite and necessity (less demand from the U.S. equals an even lower petrodollar). You’re probably wondering why treasuries are still holding steady with all this sell-off activity from foreign central banks. The answer is simple: as foreign central banks cash out, private retail investors are buying in. There’s no clear reason why, but there are enough private buyers in the market right now, who still trust the safety of treasuries as a safe haven asset, to keep it afloat. But what happens if foreign central banks keep selling at the rate they are today? All those smaller buyers will eventually wake up, smell the coffee, and start a sell-off of their own. When that hoard of buyers get spooked, a great many of them will ditch the false “safe haven” of treasuries for a true safe haven, i.e. real assets, primarily gold. An influx like that would boost prices significantly and make gold owners very happy – but only those who saw it coming and acted quickly.